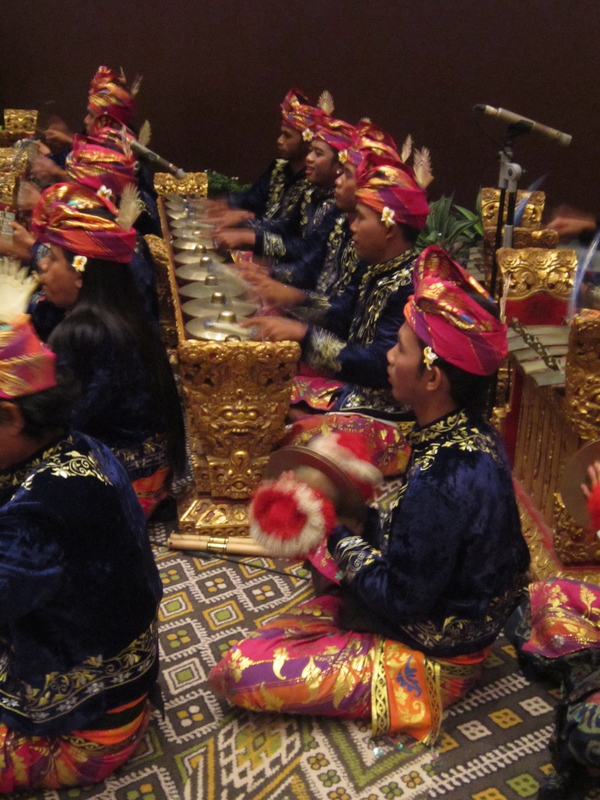 Excursions in World Music , Fourth Edition, Chapter 6: Indonesia. In the fall of 2003, as an undergraduate music education major at Rutgers, I was first introduced to Indonesia through its music. Indonesia caught my attention again in 2005 as I marked up my world map hanging on my dorm wall based on the linguistic and ethnic diversity of each country. Indonesia was etched in my memory as one of the most diverse countries in the world. Around 2006, I learned of Bali beaches through a Korean drama, “What Happened in Bali.” I was expecting the whole city to be nothing but white sand and turquoise waves. 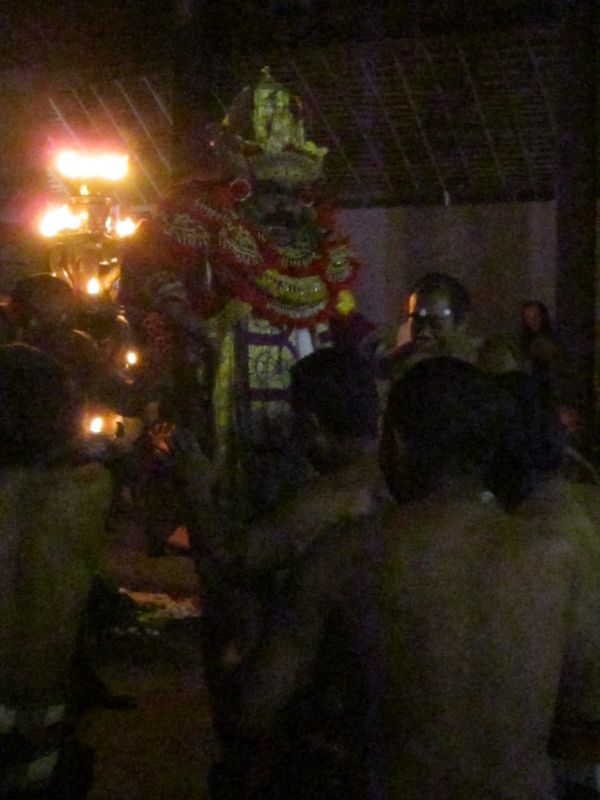 In the fall of 2010, I took a graduate ethnomusicology course at UW called “The Musics of Asia” and was not only reminded of the beauties of the gamelan, but learned about shadow puppetry and the intricate use of eye movements and facial expressions in traditional Balinese dance. It was then that Indonesia entered my list of places to visit. I had ideas about what Bali—and Indonesia, in general—might be like pieced together from my different exposures to it, but after I landed in Bali, I discovered it was not what I had expected. My view had been simple, and what I was met with was actually a seemingly inexhaustible trove of vibrant cultural and artistic expressions. 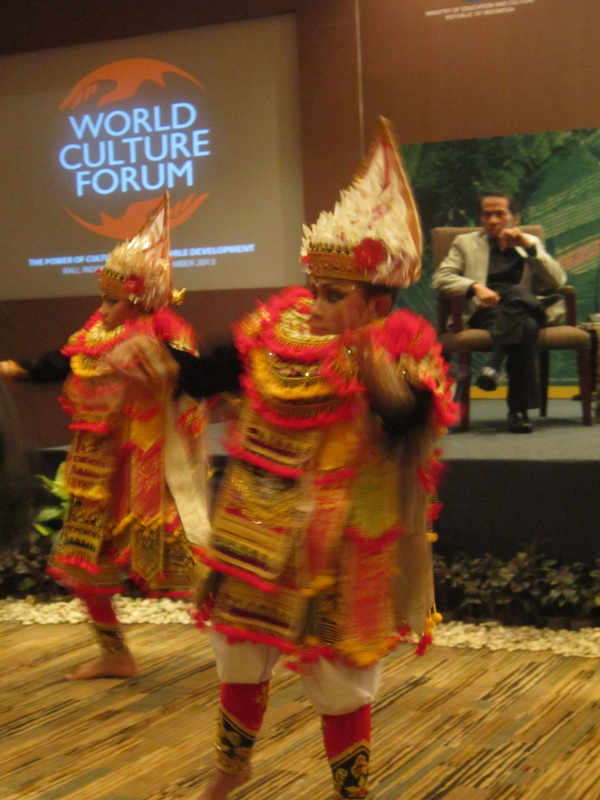 I went to Bali primarily for the World Culture Forum. The inaugural forum was organized by the President of Indonesia’s office at his request. Signs hung on road posts along almost the entire stretch between the airport and the hotel (an hour away) and wishes for a successful meeting could be seen on billboards around the island. Anyone in town could see there was a special event taking place. I arrived at the Westin Nusa Dua and was greeted by a woman in traditional dress putting a flower behind my ear. I continued inside to register and have my security badge photo taken. While I waited at the counter, I was brought a moist towelette and fragrant tea. 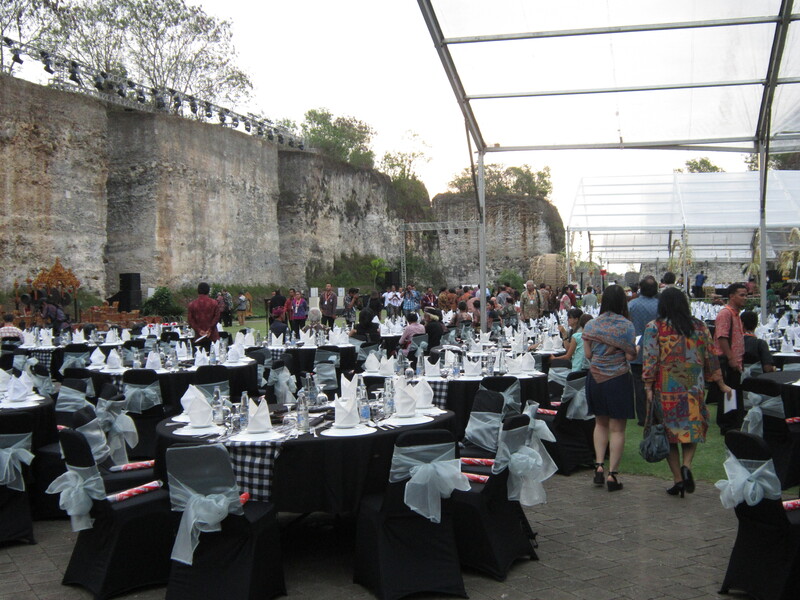 A Gala Dinner kicked off the event the first night and set the tone for the days to follow. 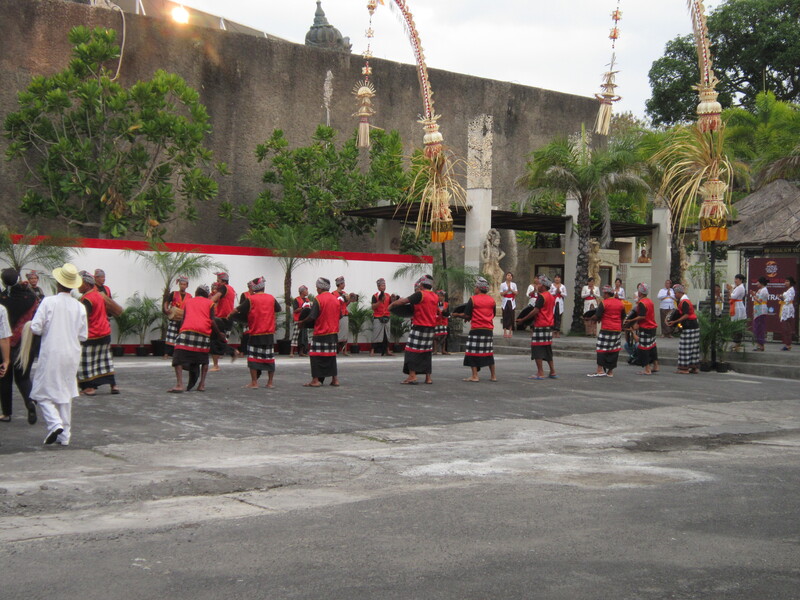 We were greeted by performers as we got off the bus at Garuda Wisnu Kencana Park. The venue was magnificent and as we entered to the sounds of traditional instruments there was a frisson of excitement. 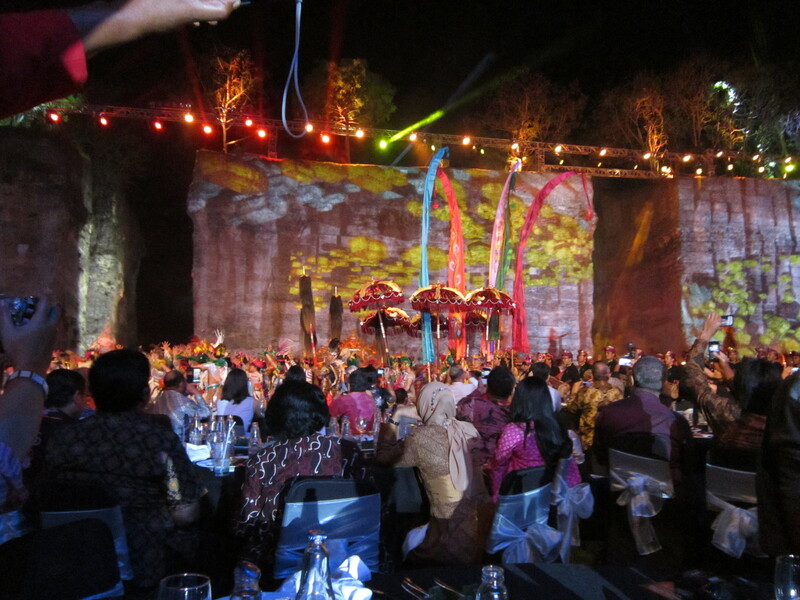 As you might expect, it was a spectacular event and the President of Indonesia himself attended. I donned my special formal Lao sinh and custom-made Lao-style shirt. Although it was rainy season there, the tables were arranged outside without covering. The explanation I was given was that they had paid someone to keep the rain away for the evening. Not to keep it from raining, but to redirect the rain elsewhere. A woman on the bus had told me when she had parties for her kids she would pay for the same service. If I remember correctly, this person, called a pawang hujan, redirects the rain through smoking. WCF umbrellas were waiting for us at our table, however, just in case they hadn’t paid them enough. Performers from nearly every continent came together to create a performance (check out pics here) that could best be described as reflecting the beauty of intercultural harmony. (Or, if you went to Rutgers, it’s like a dance version of a fat sandwich). 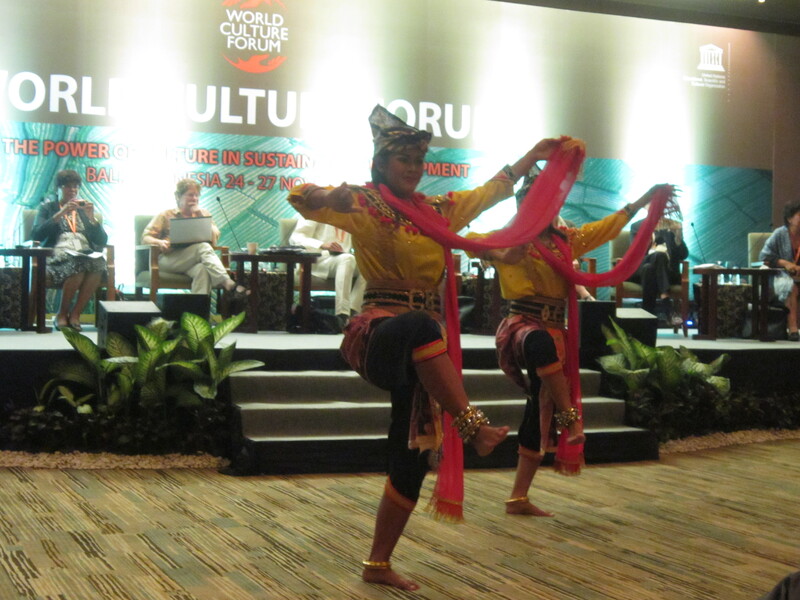 As the forum got underway, the organizers showcased the diverse performance art traditions of Indonesia. 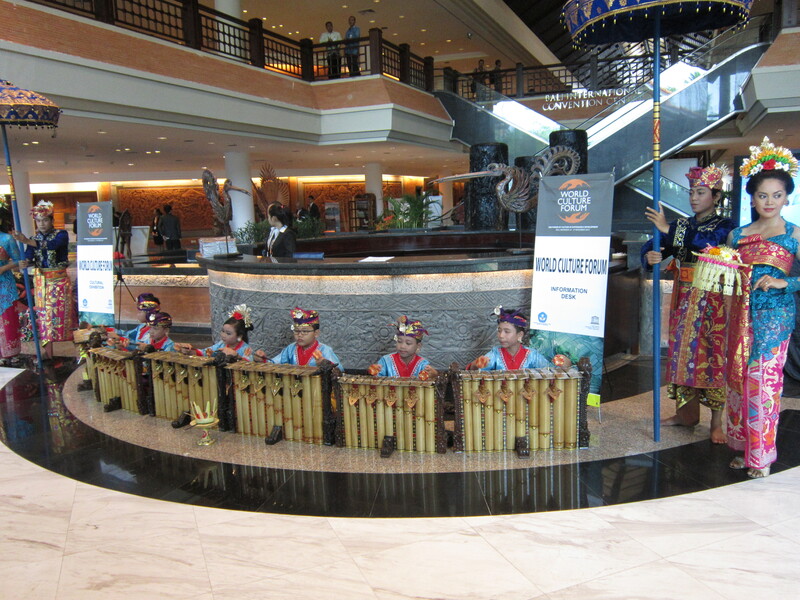 Before every plenary session, there was a dance performance or a live ensemble playing as people entered the hall. At the beginning of breakout sessions, we were treated to dance performances as well. There was a world music and dance festival running concurrent with the forum and one evening they bussed us out there to see the performances. 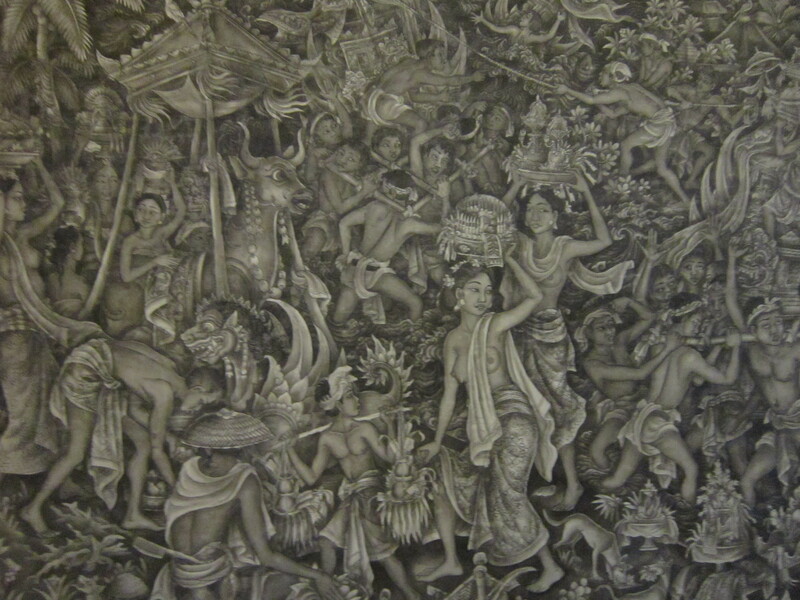 I felt my appetite for Indonesian arts had been both filled and yet still left unsatiated. My desire had only been heightened by what I had already seen—I couldn’t get enough! There were several museum visits as a part of the event. They had rented their space out for our dinners. 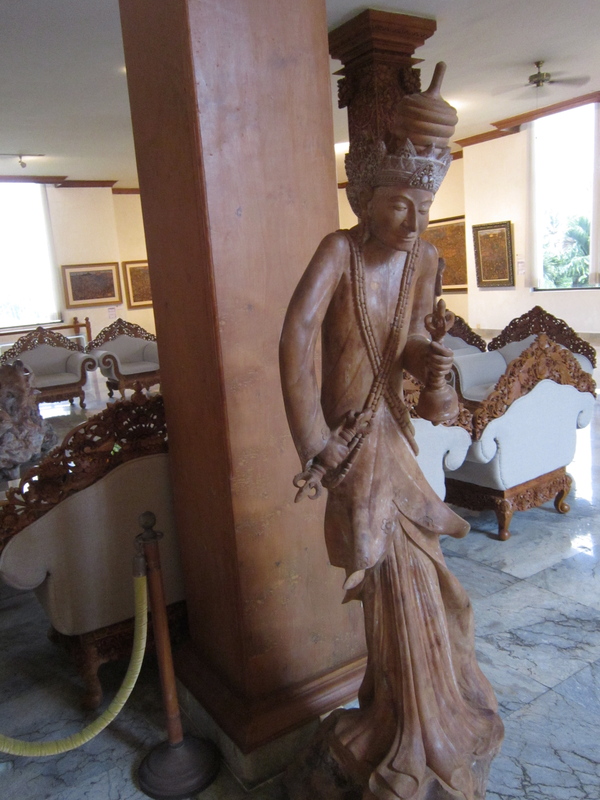 I went into this trip most knowledgeable about Indonesian music and dance. I could not have told you a thing about what the art looked liked, traditional, classical, or contemporary. 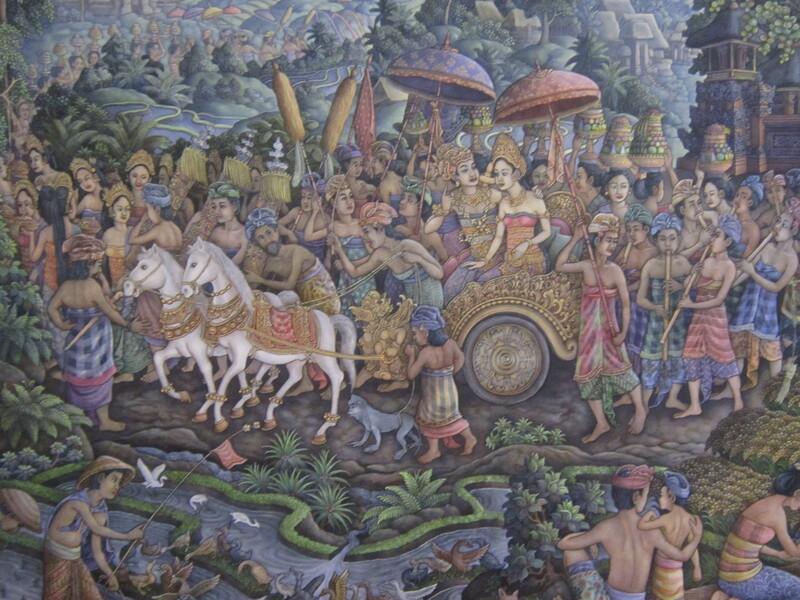 The Balinese paintings I saw were completely mesmerizing. Both aesthetically and intellectually, I was intrigued. 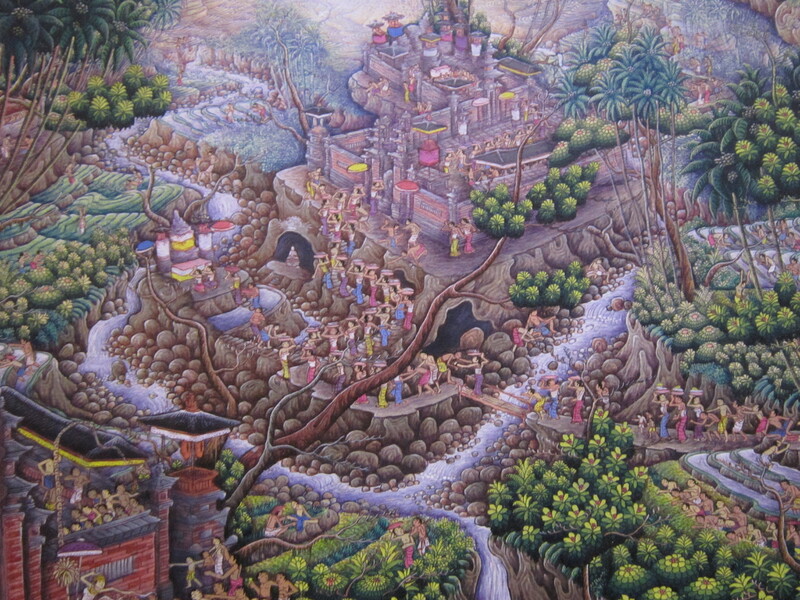 On their own, the composition, use of colors, and detail were incredible: Indonesian folklore, literary heritage and landscapes provide a rich source of inspiration. 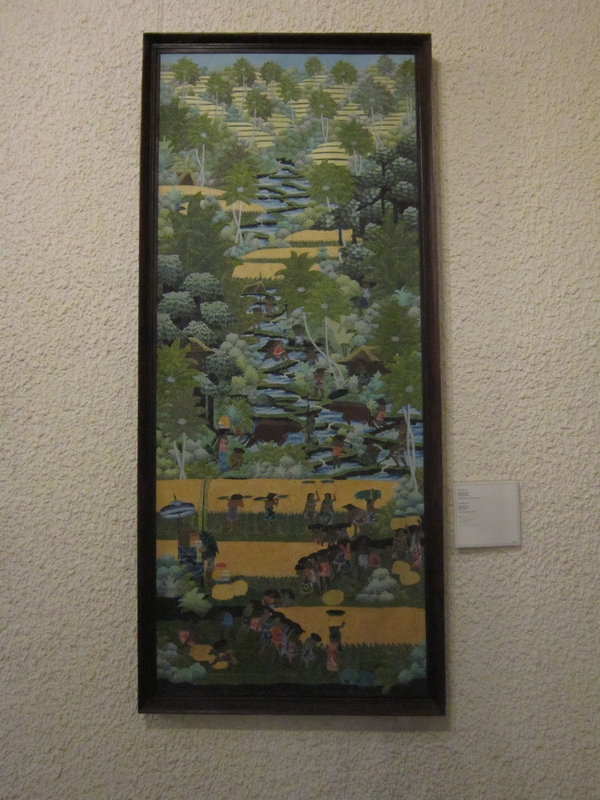 But, my mind jumped into art history mode as I compared Balinese paintings with the only other kind of art I’m familiar with: Chinese. I caught myself imagining myself as a PhD art history student comparing the two art traditions. I just wanted to keep lingering at each piece of art, but there was so much to see. You can’t just glance at these paintings. There’s so much to take in in each one. Between the stones, the tree tops, and the people there is no unused space in this painting! This one, probably because of its orientation reminded me most of a Chinese landscape painting. This was one of my favorite paintings. Look at how many faces there are! It wasn’t just the paintings that were remarkable. 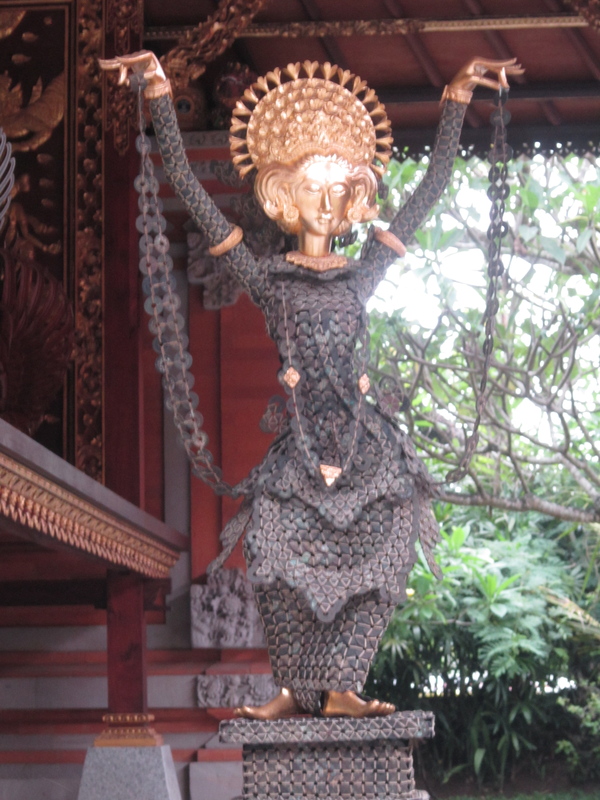 There were stone or wood sculptures everywhere, ornate high-relief friezes covering almost every free surface, elaborate temples, unique batik. My brain was over stimulated and swelling with questions to investigate when I got back home. We also spent a lot of time in transit. Dinners in the evening were usually an hour to an hour and a half away. During our bus rides through residential areas I got to see yet a different side to Bali: home architecture and everyday life. I wasn’t sure what I was looking at at first, it looked like rows and rows of temples. When I asked, I was told that Balinese homes have their own temples in front. Each neighborhood had several public temples too. Altogether there were more temples then than homes! I also saw kids outside playing, women carrying heavy loads to offer at temples on their heads, and I saw people gathered for a wedding. With over 13,000 people from 67 countries at the forum, it would have been hard not to meet someone from some place new. My conference buddy was a cultural officer from Namibia (who I was always getting confused for). I shared a hotel room with a college student from Myanmar. I sat next to the Afghanistan Ambassador to Indonesia on the bus and chatted with the Secretary of Culture from Sri Lanka who sat behind me. An anthropology professor from Ethiopia wrote down my name in Ethiopia’s abugida (their writing system) in my Moleskine. I met a man from Fiji (I hadn’t known people from Fiji looked black), a female student from Iraq, a man from Sierra Leone, and, of course, many lovely people from Indonesia! I was the only delegate from Laos and was surprised by how many people did not know where it was or that it was its own country. My last two days in Bali, I got to play. 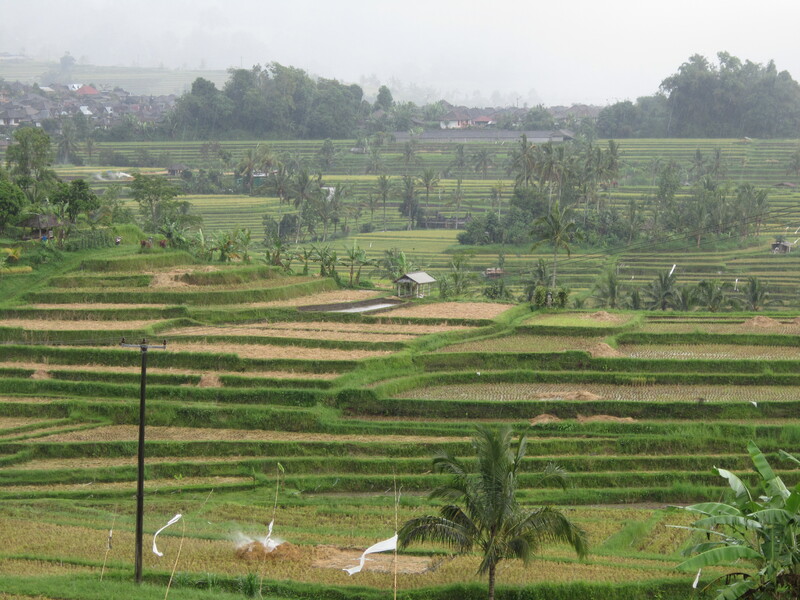 The first day was a tour organized by the conference to a UNESCO World Heritage site to see a special rice paddy irrigation system developed in Bali and to the Monkey village. In between, there was lunch at an art museum, and at the end of the day, a closing dinner at a puppet museum. Not being much of a monkey/zoo person, I found the heritage site much more interesting. I also bought some batik. The second day, I was really on my own and I…went to a museum and a gallery. I know what you’re thinking, how many museums can one visit on holiday? Well, a part of my purpose in going was to see if there might be a fit for me at a museum in Indonesia for a Fulbright project. The sun went down on my last day in Bali as I made my way down a poorly lit street with a Chilean woman, also lost, to a kecak performance. I had seen one once before on video in my ethnomusicology course in grad school. Seeing it live was amazing! From my front row seat, I spent most of my time fixated on figuring out who was performing which roles among the chanting performers. Clearly, someone was responsible for cuing the different syllables, someone did the sung interludes, someone else was the group metronome. I was taken back to my college ear training class days of beating polyrythms on my desk. What a wasted opportunity that my ear training teacher hadn’t gotten a hold of kecak notation and had us perform it as a class! Bali was great fun and it wasn’t even my favorite place in Indonesia. 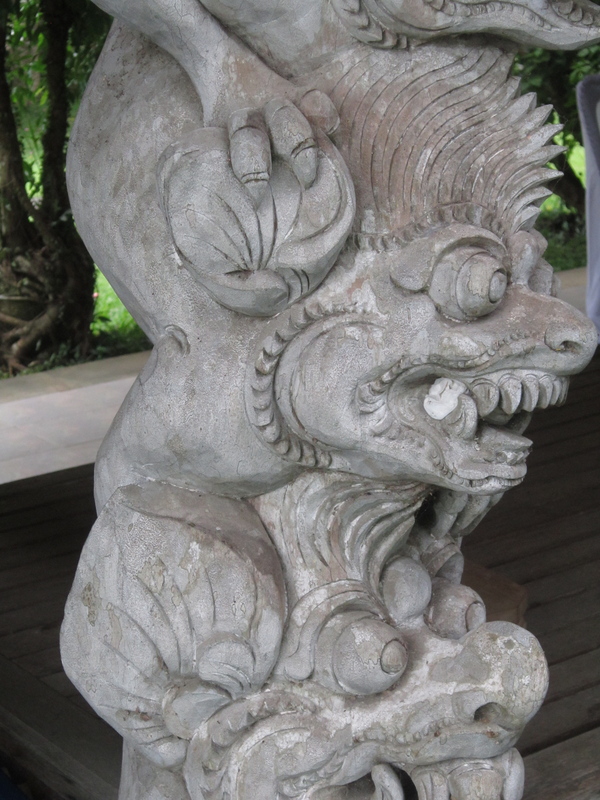 I’d definitely like to go back and explore some more as well as do some personal research projects on the arts of Bali. 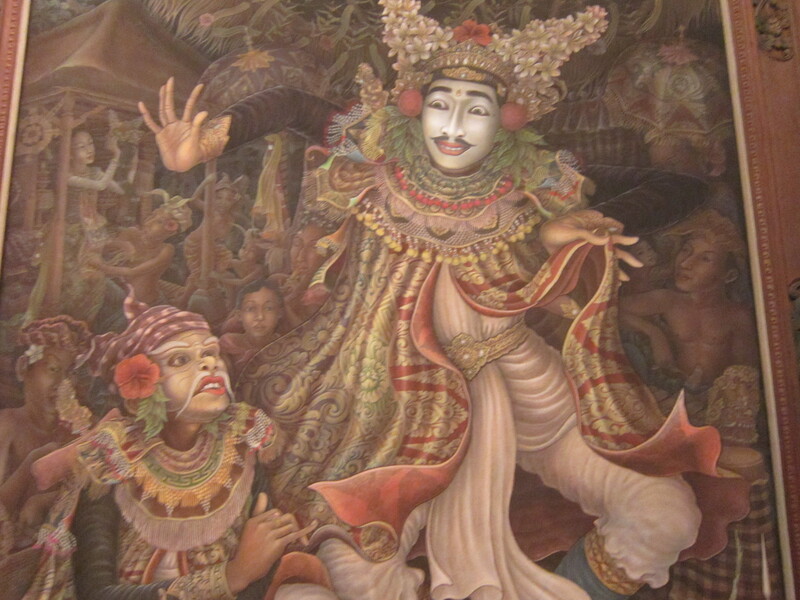 I can see myself collecting a small library of books related to Balinese architecture, dance, puppetry, and art. I caught up with a friend after I got home and mentioned that I hadn’t even seen the beach. She said that she hadn’t thought that I would and that if I had come back merely praising the beaches she would have been disappointed in me.